Sean Dyche admits his side are playing with an element of fear, after their fifth defeat in six games. Dyche had no complaints as his side were comprehensively beaten at Crystal Palace, and he feels his players have lost the Eye of the Tiger. Asked if there is any dressing up the performance, he said: "No, no, the best side won, particularly second half, not so much first half, when there wasn't that much in it. "It was a poor goal, really poor, and we have to get out of that habit, that's for sure, but second half they were the better side." 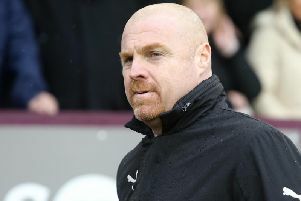 And Dyche is determined to put things right, starting with some graft on the training ground: "When fear comes into performances, it's like losing the Eye of the Tiger. "We've not lost it, we've softened with it, when you do that, it's like being a good boxer, it happens, and you have to work it out. "Usually you do that by getting back in the gym and working hard, and that's what we'll have to do. "But the fear attached to football does change the way a team operates, the distances, the fluid way you read a game - anticipation is a massive thing in football, and when you see a team playing well, they anticipate well in and out of possession, the shape, their next movement. "When you see a team having a tough time, it goes a bit individual, they think 'I just need to do my job today', and that is an important factor. "You need that looseness to go and operate in a more natural manner. "We look unnatural, it looks like people are just in those slots to do their own job and try and get that sorted. "You've got to release a little bit and get that team movement , in and out of possession." You wondered whether dropping to 18th would be a wake up call, but Dyche added: "I don't stare at the league table, but you have to be aware of it, we've got to get back to a consistent level of really strong performances. "I think the last couple have been at least okay, Leicester and Newcastle, today we slipped back again, so it's about the what's why's and wherefore's moving forward and finding that consistency." Stoke and West Brom were surprise strugglers last season, and both were relegated after getting into a rut, and Dyche noted: "That's what you want to see beyond, but we've got to get back to performances, although you'd take a lucky one, and the strangeness of football is that sometimes that can break it back open again, it just loosens and you win a few games like Newcastle. "We had a run earlier in the season, one point after five games, and popped out of that, and we've come away from it again. "It might be two steps forward, one back, but we have to keep building. "We have to have the mentality to get back to the Eye of the Tiger and playing with that edge. "It's been drifting in and out all season, which is why we haven't had consistency of performances, never mind results."